The role of an artist manager varies greatly from band to band. 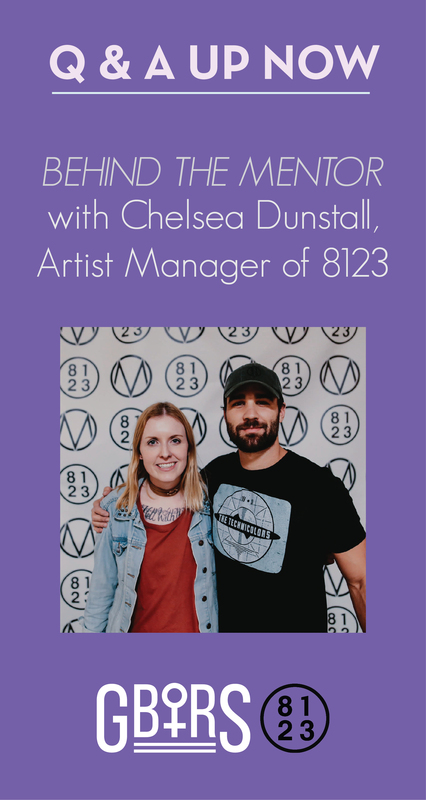 In Chelsea’s case, she co-manages or assistant manages most of the acts on 8123’s roster alongside Tim Kirch. 8123 differs from many other management companies because they don’t have a large staff and predominantly work with bands that follow a DIY mentality. This means no two days are ever the same. The main role of a manager is to liaison between an artist and the rest of their team (agents, publicists, promoters, labels, etc) to ensure their artistic visions are communicated effectively. Chelsea’s day-to-day includes tasks such as handling press, working on marketing plans for tours or releases, organizing tour logistics, drafting budgets, supervising street teams, coordinating the non-profit branch of 8123, managing calendars, assorted label services, answering fan inquiries, conference calls, and handling several email accounts. Post 8123 Chelsea and Tim Kirch. “Exhaustion.” Photo Credit: Lupe Bustos. What made you want to go into music? A passion for music, but serious lack of musical talent. I’ve always been drawn to the arts and creative industries but never found my calling as a performer. I realized my skill sets were much better suited to behind the scenes and ultimately I wanted to find a way to work in music. Again, passion. I spent my teenage years at every show I could and got my foot in the door by joining street teams. Eventually, I was asked to help run a couple and things picked up from there. It took a long time and a number of internships before I landed my first paid contract but persistence and hard work eventually paid off. What’s been your biggest challenge as a woman in music? Trying to fit into a boys club. One of my first jobs in the industry was working in production as stage crew at a music venue. I saw a lot of prejudice and struggled to be taken seriously initially. I felt like I always needed to start off by proving something that my male coworkers did not have to. What does empowerment in music mean to you? To me, it means supporting our sisters and lifting one another up. Too often in society women are pinned against one another and told to compete. I love hearing about the success and journeys of other women in music. What are you hoping to gain from mentoring a young woman in music? I’m hoping to be able to give back the opportunity that was given to me. I was very fortunate to have a female mentor take me under her wing early on in my career. She inspired me and helped give me the drive I needed to get my start. I’ve spent the past number of years establishing my career in music, and finally feel like I am in a position to help other women find their place in the industry. What’s one piece of advice you’d give to a young girl trying to get their start? It sounds cliche, but believe in yourself and never listen to anyone who doesn’t. 8123 is primarily an artist management company that focuses heavily on supporting artists at a DIY level. They maintain a small but close-knit roster and offer many label services to their bands as a result.